QUESTION ONE: IS THE TM 250 CROSS ENGINE FAST? It depends on what your expectations are. If you have had previous experience with pipey, high rpm, neurotic Italian deuce-and-a-halves, the 2000 TM 250 will be a pleasant surprise. It’s a torquey, manageable and decent midrange engine. The exact opposite of the Italian model. Is it fast? No, but it is amiable, easy-to-use and competitive. QUESTION TWO: IS THE ‘00 ENGINE BETTER THAN THE ‘99? Let’s be serious. Who cares? 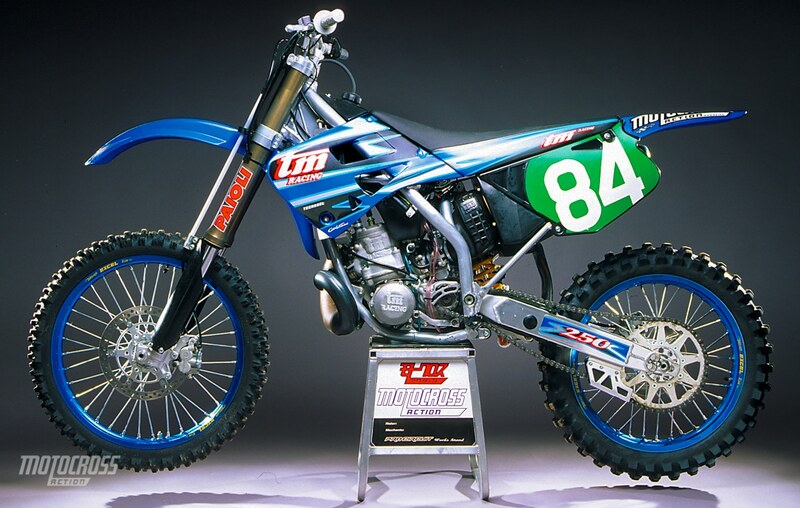 The number of people in the United States who raced a 1999 TM 250 Cross wouldn’t make up the brass section in Pavorotti’s orchestra. The TM Owners Group could hold its convention at Colonel Sanders. QUESTION THREE: WHAT IS THE TM 250 POWERBAND LIKE? Here are two bikes it’s not like: (1) It doesn’t have the low-end grunt or pure horsepower of a KX250. 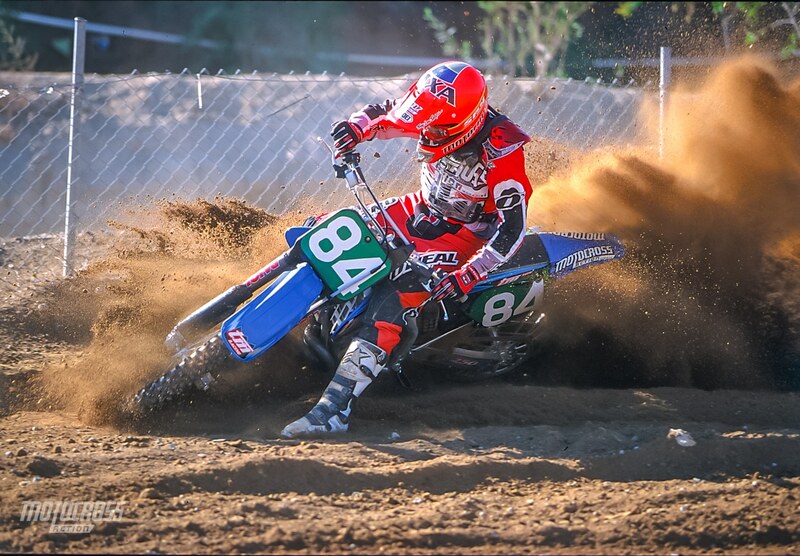 (2) The spread of power is no match for the broad, metered pull of the YZ250. What would we compare it to? It’s kind of a Suzuki/Honda combo. It’s torquier and has a little more flywheel effect than the Suzuki, while it acts like a clipped-wing version of the CR250 engine. Translation? The TM 250 Cross powerband is adequate down low, but nothing that you would want to depend on. Power builds in the middle and makes a snarling, growling and effective rush into the lower ranges of the top-end. Then, it signs off. 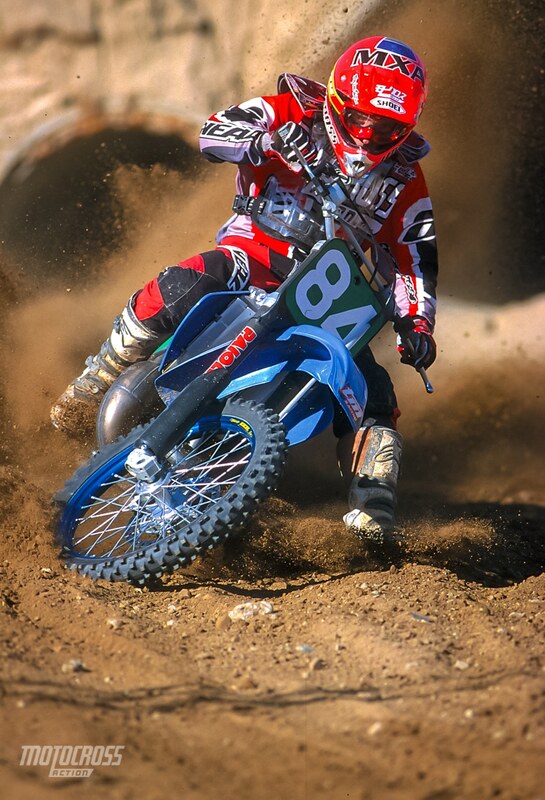 It is not broad like the YZ or potent like the KX, but dovetails neatly between the midrange RM and CR. 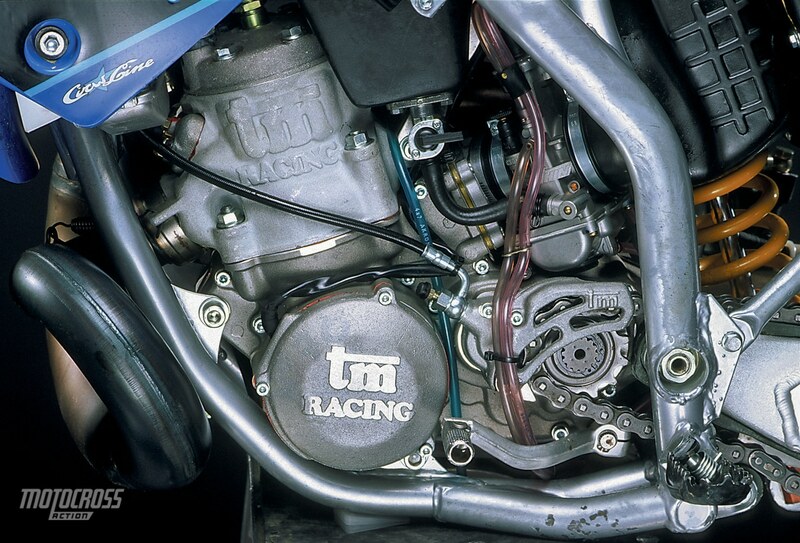 QUESTION FOUR: HOW GOOD IS THE TM 250 ENGINE? QUESTION FIVE: WHAT ABOUT THE JETTING? Straight out of the Italian crate, the TM 250 Cross runs fine. But, there is one caveat. The Italian engine requires the highest octane gasoline you can afford to feed it. That means straight out of the tanker 92-octane or a 50:50 mix of discount 92 with 100-octane race gas. Notes: If you were expecting a Dellorto carb, breath easy. 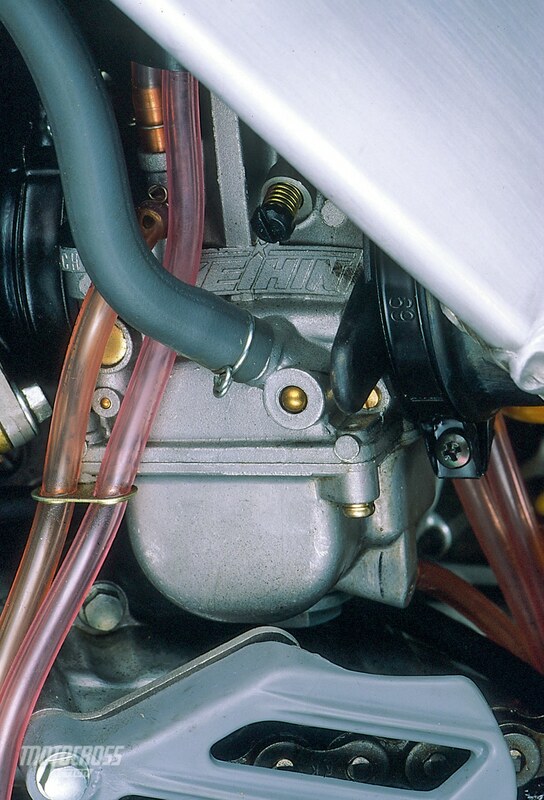 The TM 250 uses a ubiquitous 38mm Keihin PWK carb. This makes jetting a lot easier. QUESTION SIX: HOW GOOD IS THE HYDRAULIC CLUTCH? Last year we didn’t like TM’s hydraulic clutch–even though we constantly rave about KTM’s almost identical unit. This year, we were pleased as punch with the TM unit. It worked better, with smoother actuation, less lever pressure and a cleaner release. Every test rider complained about the gap between second and third (and argued about whether they should gear it up to use second in the corners or gear it down to maximize third). One tooth more on the rear is the best choice. This is not a “buy it, roll off it the show room floor and live happily ever after” suspension system, but the rear suspension is fixable with time, patience and a flat-bladed screwdriver. The Swedish-built Ohlins rear shock, unlike Kayaba and Showa shocks, is very sensitive to clicker changes. What you might accomplish on an RM with four clicks, the Ohlins achieves in one. That means that over exuberance in solving a problem can contribute to a whole new set of problems. A savvy tuner will make small changes on the Ohlins 26-click range. So what was the problem we wanted to solve? Too much low-speed compression. The Ohlins tended to skitter across braking bumps. The rear end wouldn’t absorb consecutive small-to-medium sized bumps. What was our solution? (1) Carefully set the sag to 100mm. (2) Lighten the compression damping in small increments until the shock responds. (3) Lighten the rebound damping to allow the shock to reset itself for the next bump. Notes: The Ohlins does not have adjustable high- and low-speed compression circuits, so the rider has to realize that changing the compression to fix low-speed problems will affect both high-speed compression and rebound. QUESTION TEN: HOW GOOD ARE THE NEW FORKS? 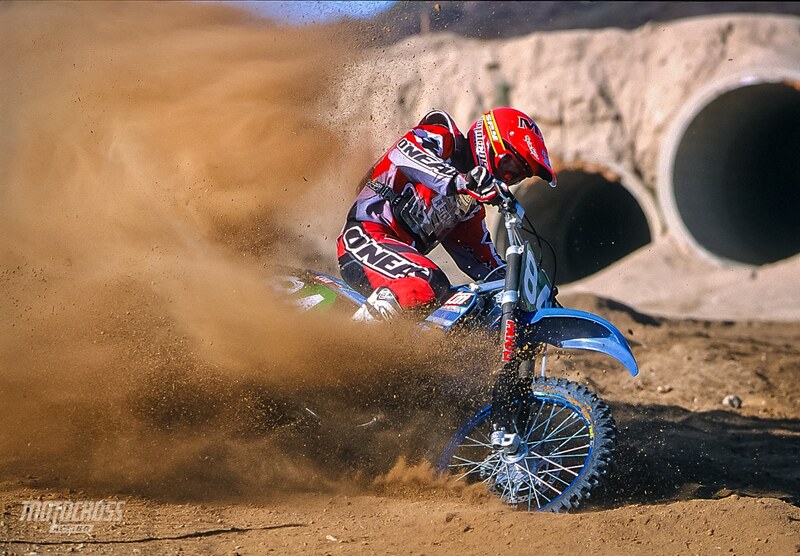 If we asked you to guess what brand of forks come stock on the TM 250 Cross, you would probably get it wrong. “Paioli,” is the correct answer. There are good reasons that very few bikes come with Paioli forks (pronounced pay-ole-lee): (1) The company is little known outside of Italy. (2) In the past, Paioli’s creative engineering left most American suspension shops scratching their heads. (3) They don’t work very well. Paioli, like TM, wants to make a dent in the American market. So, for 2000, they can be found on several Pee-Wees, the VOR 503/400 and the complete TM lineup. Additionally, the damping system has become much more Kayaba-like for 2000 (allowing hop-up shops to have a ghost of a chance of revalving them with a modicum of success). Unfortunately, good intentions and clone damping haven’t fixed the forks. The Paiolis are very harsh over the small stuff, but, not surprisingly, they are stout enough to absorb big landings and hard hits. Job number one is to trade some of the big hit absorption to improve the teeth-chattering low-speed damping. The best way to achieve this is to turn the compression clicker out and lower the oil height. QUESTION 11: WHAT ARE THE BEST FORK SETTINGS? QUESTION 12: WHAT DO WE REALLY THINK OF THE ‘00 FORKS? They are the fly in the TM’s ointment. In stock trim, they hold the bike back from achieving its full potential. QUESTION 13: HOW DOES THE TM 250 HANDLE? TM’s chromoly frame is a round tube version of Kawasaki’s perimeter frame. It’s not new! TM has offered this frame design for a while, but last year they painted the tubes black and nobody noticed them. For 2000, a coat of silver frame paint makes the frame’s unique curves stand out. How does it handle? This is the best turning Italian bike made–which isn’t saying much. The typical Italian frame has a slack head angle that corners like the Sunset Unlimited (without the railroad tracks). While not a match for a Suzuki RM250 in the tight stuff, the TM 250 Cross can stay on its chosen line. It would be even better if the forks were willing to absorb small bumps. The forks’ recalcitrance forces the chassis to stay fully extended past the braking point. Better forks would translate into a better cornering chassis. There is a noticeable amount of headshake, which is unfortunate, because pushing the forks up in the clamps would help the 250 Cross in the turns. However, sliding the forks up aggravates headshake. (1) Black gas tank: Add TM to the list of black-gas-tank bikes (Honda, Kawasaki, KTM and VOR). What’s so bad about black gas tanks? You can’t tell when they are full of gas until your boots are damp. (2) The forks: Paioli has a ways to go. (3) Rear brake pedal: It is lovely, but we didn’t like its positioning. (4) Gaskets: For some reason, every TM we test seems to weep at the base gasket. (5) Rear sprocket bolts: We don’t hate the rear sprocket bolts, we are just amazed by how many there are. Ten bolts to hold on a sprocket seems like overkill. (1) Ergonomics: The TM has a roomy feel to it and the only thing test riders complained about was that the bars felt too low. (2) Plastic: To cut costs, TM has traditionally borrowed plastic parts off of Japanese brands. This saves them the enormous mold costs associated with injection molded plastic. Last year, TM bit the bullet and molded their own radiator wings (previously they used RM shrouds). This year, they designed their own side panels (they used KX panels last year). That just leaves the fenders, front number plate and fork guards as borrowed KX parts. (3) Perimeter frame: The frame is very cool, but it weighs a few extra pounds. (4) Brake pedal: We hate how far the brake pedal is tucked in, but this is the kind of CNC workmanship we wish we’d see more of. (7) Cheater bike: The TM 250 Cross is also available in a 294cc version for Vets. This is not a mass-produced machine–even though it is mass produced. TM builds less bikes in a year than the Big Four crank out in a week. Owning a TM is like using Linux, walking in Birkenstocks or driving a bug-eyed Sprite–it defines who you are more succinctly than Windows, Nikes and a Camry. You pay a price to be different. What’s the price? You have to fix the forks.